The Sentido Vasio Resort & Spa, nestled above a small cove in the idyllic village of Sissi – northeast of Crete, is a one-stop retreat for honeymooners, couples, families and solo travellers. At a distance of 45 km from the island capital Heraklion, this plush property boasts fitness studios, specialist restaurants, bars, children's club, spa and wellness centres complemented by an array of 7 pools. The hotel overlooks the endless horizons of Cretan Sea while the magnificent mountains of Lassithi also grace the window frames of the 300 elegant rooms of the splendid property. Besides the cosy rooms, there are luxury suites with private pools and sea views to pamper you on your vacation. The close proximity to the two beaches on either sides of the hotel is an added attraction for adventure lovers. Whether you're planning a family vacation, a romantic holiday or a spa/gastronomic break, this hotel is the ideal accommodation option for a relaxing stay in Sissi. 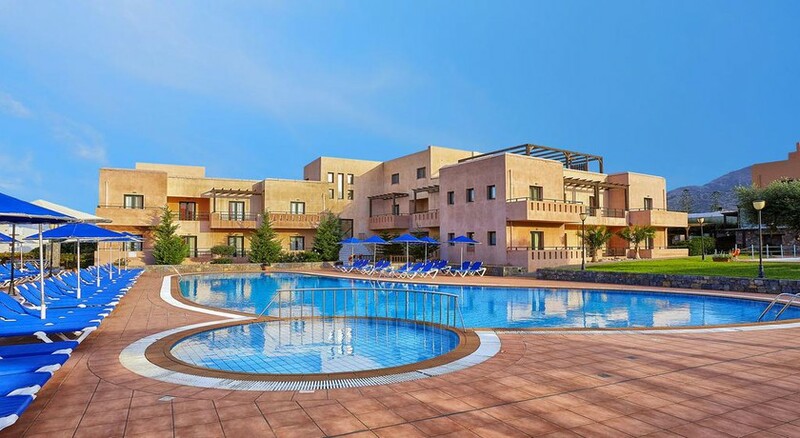 The Sentido Vasia Resort is surrounded by several cafés, numerous tavernas, and countless small shops on the harbor which makes it a perfect hop off point for party animals and shopaholics. The Sentido Vasia Resort & Spa is one of the most preferred stay options in Crete – thanks to its strategic location in the centre of the island. The hotel serves as an ideal base for almost all the major excursions on the island. The nearest airport is 37 km away in Heraklion, while Malia – the nearest big town – is 6 km away. The rocky beach, which is around 100 metres from the hotel where you can snorkel and scuba dive. And if it’s the sand that you crave for, the nearest sandy beach is just a kilometre away. The hotel features 300 rooms – 153 junior executives, 45 family suites, 40 double rooms, 40 superior double rooms, 9 executive suites and 13 VIP maisonettes. The rooms and suites come with modern furnishings complemented by private balconies, gardens and en-suites with all updated amenities. The interiors guarantee a warm ambiance. Every accommodation at the Sentido Vasia Resort & Spa is equipped with satellite TV, air conditioning, telephone, safe deposit boxes, hairdryer, sofa bed and Wi-Fi. The friendly hotel staff will help you with added facilities in case you need an extra bed or a crib. Four restaurants and six bars cater to the food and drink services at Sentido Vasia Resort & Spa. They serve some of the most authentic Greek cuisines. Dionysos, the main restaurant, offers international buffets for breakfast, lunch and dinner where the dinner is usually themed around Greek, Asian, American and African delicacies. The other three restaurants at the hotel are Pelagos Taverna, La Trattoria and 1996 Gourmet Restaurant. The bars at this hotel are no less of an asset either – Lobby Bar, Pool Bar, Blue Bar, Players Club, Cotton Club and Panorama Lounge are the 6 gems. You can spend your evening watching live events or playing house games and taste some of the best signature mixes and infusions, along with relishing snacks and meals. The Blue Bar offers wonderful views of the vast sea and you can enjoy a quite sunset from its private lounges. Besides, if you are staying for a minimum of 7 nights, the hotel serves you a complimentary dinner at Pelagos Taverna or La Trattoria. Theatre, volleyball, football, table tennis, pool table (extra charge), water polo, video games and a gym – there is almost nothing that you will not find at the Sentido Vasia Resort & Spa. For water lovers, the hotel has got two main pools, a side pool, private pools in the suites and a kid paddle pool. 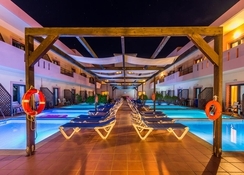 There are plenty of sunbeds and umbrellas around the main pools, and if you want to try your hands at water games, a number of options are available, such as water polo, water gymnasium and water volleyball. In case you don’t want to miss your fitness routine while you are on the go, the hotel has a gym that comes with personal trainers. 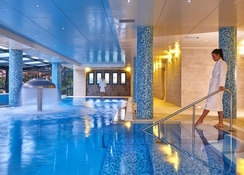 The on-site wellness centre features an indoor pool, a steam room, lavish massage rooms, sauna and a children’s spa. There is also a small playground and the hotel runs a children’s club for the young guests. Internet and Wi-Fi comprise of the basic amenities, yet you have the internet corner at your disposal. The beach is almost 100 metres away from the property and if adventure is on your mind, the hotel arranges various water activities like snorkeling and scuba diving.